Harvard’s first LEED Silver building. 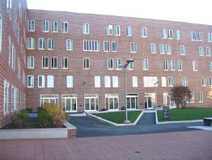 One Western Avenue is a graduate student housing building located in Allston, MA. The project provides about 229,000 gross square feet of new housing broken into 235 apartments to house approximately 365 occupants. In addition, there is underground parking for approximately 625 cars. The project manager introduced a commitment to sustainability early in the design process by choosing to trial the LEED standard . In addition, the project design underwent an intensive 40-year life cycle costing analysis. The study looked at sustainable alternatives in terms of initial capital cost, on-going maintenance, on-going utilities, and cost of replacement to maximize the energy efficiency of the design. Through this comprehensive process, the project successively was designed to be 50% more efficient than code and became Harvard's first project that achieved a LEED Silver Rating.